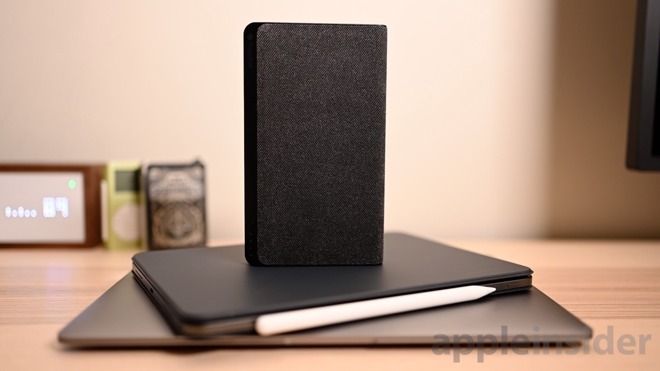 Mophie's latest battery pack is the Powerstation USB-C 3XL which has timed its release perfectly with that of the latest MacBook Air and iPad Pro. With a massive capacity and versatile outputs, this battery can easily power all your gear. On the outside the Powerstation 3XL is a soft fabric finish, which we first saw and immediately fell in love with on the Powerstation USB-C XXL. It feels durable, soft and grip-able to the touch, and better than the metal exteriors employed by other batteries. When battery packs are made of aluminum, they have a higher chance of being dinged and damaged themselves, as well a harming your other gear. Slide a giant metal weight in a bag with a Mac and an iPad could result in a cracked screen or scratched finish. Mophie has once more employed a similar design here, akin to similar batteries in their lineup. Three ports line up along one end, with a slightly angled side home to a quartet of status LEDs and a status button. Unlike the smaller-capacity USB-C batteries, Mophie has included a dedicated USB-C port as well as a dedicated USB-C output. Each USB-C port can handle 45W of power, which means not only does the battery refill quickly, it can charge your gear hastily. Speaking of, this battery pack seems tailor-made for Apple's latest wares. That 45W of USB-C power is easily enough to charge your new MacBook Air or iPad Pro. The rub comes with the second output port, USB-A. USB-A makes sense if you are using a USB-A to Lightning cable to power up your iPhone while using USB-C for your Mac or iPad. If you want to charge your phone with Apple's USB-C to Lightning cable, then you're in a tough spot. Mophie could have included two USB-C outputs to fix this, but as Apple is the only one who sells USB-C Lightning cables, the amount of us using them is relatively small. We've seen batteries above 26,000mAh before, but rarely. 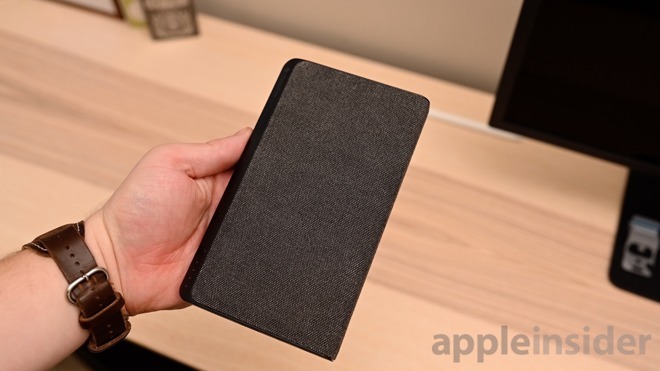 This makes it the largest battery in Mophie's lineup. For those wondering, that equates to roughly a 96Wh battery, which is near the 100Wh maximum put forth by the FAA. In other words: yes, you can take this on a plane with no issues. Mophie has a wide variety of battery packs — that is their bread and butter after all — but the Powerstation USB-C 3XL falls in line with two other similar models. 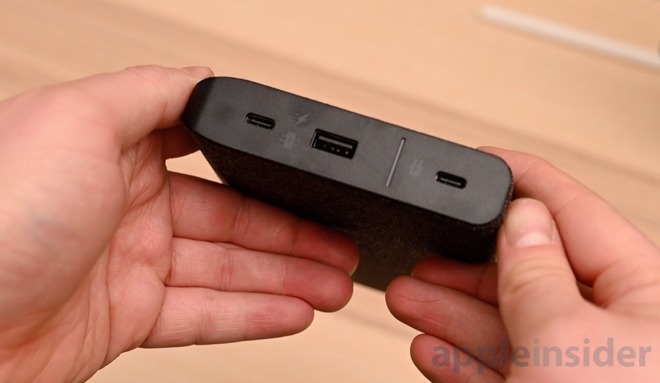 There is the Powerstation USB-C XXL and the Powerstation AC that sport the same physical shape (though different sizes) and fabric exterior. Depending which model suits you, there are trade-offs. Be it output speed, input speed, capacity, or ports. The most cost-effective model is the Powestion USB-C XXL which rocks a 19,500mAh battery with a dual-use 30W USB-C input/output and a USB-A port. Because of the single USB-C port, you can either charge two devices at once, or charge one device (over USB-A) and charge the battery pack at the same time. 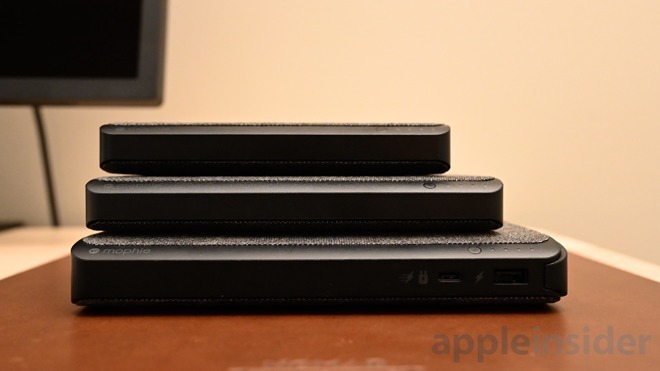 Splitting the top tier — also running $199 — is the Powerstation AC. It's got a 22,000mAh capacity, a dual-use 30W USB-C input/output, a USB-A port, and a 100W AC outlet. If you are looking for the highest capacity, go for the 3XL model. Want to plug in your MacBook Pro and charge it as fast as possible? Then the Powerstation AC may be a good fit. Want USB-C in the smallest package? That's the XXL. The brand new Mophie Powerstation 3XL is an Apple Store exclusive, which means you can find it at your local establishment, or from Apple's online storefront for $199.